If you’d like to be featured (anonymously or otherwise), please fill out this form! You can see all posts in this series here. Full-time daycare, at a national chain — $206.10 per week, including a 10% company discount. 6:30 a.m. Our daughter comes into our room and squeals with delight to see we are awake. My husband was sitting up in bed with his iPad; I was actually under the covers trying to not be awake. We put her in bed between us and turn on some cartoons. 7:00 a.m. I go out for a short run before it gets too hot. Sundays used to be my long-run days, but I’ve really dropped off on my runs lately. When I get home, I water the garden with my daughter. My husband makes French toast for breakfast. 9:00 a.m. I throw in some laundry while my husband and I try to come up with a menu and grocery list for the week. We make dinner at home Sunday–Thursday, and we usually make an extra casserole or something to pack in our lunches all week. We play play-doh with our daughter. 11:00 a.m. We head to the grocery store. Sunday lunches are always the grocery store salad bar. I absolutely hate trying to think of “What are we going to eat?” so either having it all written out or having a certain place to always eat relieves that stress for me. 12:30 p.m. We eat lunch and discuss trying to put our daughter down for a nap. We decide it would be an exercise in futility, so we take turns playing with her, doing laundry, and making the casserole and prepping salads to pack in our lunches. 3:30 p.m. I love to bake, and I have designated Sunday as baking day. One day I hope my daughter will bake with me, but right now she goes to play with her father. 5:00 p.m. I fold a mountain of laundry while my husband makes dinner. 6:30 p.m. One of my friends who lives nearby comes over, and we go canvassing our neighborhood. She, my husband, and I all joined Indivisible this year, and the canvassing is related to that. My husband stays home with our daughter. 8:30 p.m. I return home. My husband is just finishing up putting our daughter to bed. We’re going out of town next week, so we sit in bed and look online for restaurants and places to take our daughter. We go to sleep between 9:30 and 10:00. 5:00 a.m. The alarm goes off, and I let it snooze a little. I want to just stay in bed, but I go to the YMCA to swim some laps. The Y is less than a mile from our house. 6:00 a.m. My husband makes breakfast — eggs, turkey bacon, fruit, and oatmeal. His hobby is bodybuilding, so he eats a lot, but I only eat the oatmeal. Our daughter picks at this and that. 7:30 a.m. My husband leaves for work. We typically carpool on Mondays, but I have a doctor’s appointment today and will go in to work later. He takes in the leftover Sunday dessert — our coworkers have come to love Dessert Mondays. My daughter and I play for a little while. 8:30 a.m. I take my daughter to daycare and I visit the doctor. She tells me what I’ve known for the past two weeks — I’m pregnant. We had only been trying for one month, so we were pretty surprised it happened so fast. As I leave the doctor, I text my BFF. 10:00 a.m. I get to work. My husband and I work in the same room (separate cubicles), and we IM each other all day, and sometimes wink and flirt when we pass in the hall. We’ve been together nearly 10 years, and worked together before that, and our relationship has never been an issue at work. 5:00 p.m. My husband leaves to pick up our daughter from daycare. I’m in a meeting that is scheduled to end at 5:30. 5:45 p.m. I head home. My husband has already started making dinner. 7:30 p.m. I put our daughter to bed while my husband cleans up the kitchen. 8:30 p.m. My husband built his own gym in the garage, so he goes out there to do his workout. I Facebook/Pinterest for an hour and go to bed. The best part about working at the same company as my husband is that I don’t need to provide him any backstory when I vent about people or things at work. The biggest downside is the teasing from coworkers about us being a couple. 5:00 a.m. I lie in bed and watch the local news for half an hour before getting in the shower. My husband surfs the Internet in bed. 6:00 a.m. I go out to water the garden and feed the outdoor animals while my husband makes breakfast. It’s possible for mosquitoes in my area to have Zika, so I try to be careful about exposure. I don’t feel like using bug spray this morning, and I’m wearing pants, so I put a raincoat on to cover my arms and neck. I’m sweating by the time I finish outside. 6:30 a.m. I get my daughter out of bed. Some mornings she will eat, but if I have to wake her up she usually won’t touch a bit of breakfast. Today is a no-eat day, but she gets breakfast at daycare, so I just let her do her thing. After breakfast she typically gets to watch cartoons while we brush our teeth, pack lunchboxes, etc. 7:30 a.m. My husband takes our daughter to daycare, and I head straight to work. 5:00 p.m. I leave work and go to the gym. I do a bootcamp class on Tuesdays and Thursdays, and they are my favorite workouts of the week. The other women in the class and I have all become great friends. During my first pregnancy, I continued these workouts until I was 36 weeks (I gradually reduced my intensity as I got bigger), and I hope to do the same during this pregnancy. Another woman in class had a baby two months ago, and a third is currently 18 weeks along. 6:15 p.m. Bootcamp done, I head home. My husband has already picked up our daughter and has dinner ready. 7:30 p.m. I take a shower with our daughter, and my husband puts her to bed. I clean up the kitchen. 9:00 p.m. Bed. So tired. 5:00 a.m. I let the alarm snooze until 5:30, then I lie in bed watching the news until 6:00. 6:00 a.m. It’s trash day, so I gather up the recycling while my husband cleans the kitty litter. This is all easier when our daughter is still asleep, but today she has woken up early and is getting in my husband’s way while pointing at the litter box and screaming “Ew! !” I give her some boxes to help me carry out to the curb. 6:30 a.m. Breakfast. Our daughter is eating this morning, but very slowly. I clean up the kitchen while my husband goes to shower. 8:00 a.m. My husband and I ride together to drop off our daughter and go to work. 5:30 p.m. We leave work and pick up our daughter on the way home. 6:15 p.m. My husband makes dinner while I check the mail, empty the lunchboxes, etc. Our daughter is in the habit of watching her Kindle while my husband makes dinner. Its lot easier for him that way when I’m not here, and she considers it part of her routine even if I am here. 7:30 p.m. Our daughter prefers to have her father put her to bed right now, so he takes care of her while I clean the kitchen. 8:30 p.m. My husband goes to the garage for his workout. I lie in bed and watch TV/check Facebook. 10:00 p.m. I go to bed. My husband won’t finish up for a while, but I never wake up when he comes to bed. My answer may be kind of unexpected but is a great thing. I’ve faced very few challenges as a woman. When my aunt graduated high school in the ’70s, she wanted to be an engineer but colleges would not admit women. I went to an engineering-specific college, and while it was mostly male, study groups were formed based on ability rather than gender. My company has been very serious about diversity for years, and we have a culture of respect. One of the few examples of sexism that I’ve experienced came from a mechanic shortly after I was hired out of college. He wanted to talk to my boss rather than me, so I rejected the mechanic’s request for an engineering change. My team is mostly male, but I know the company is working on initiatives to encourage and hire more women in engineering. 5:00 a.m. I lie in bed glaring at the alarm until 5:45, then decide I really should get up. I hose myself down with bug spray to take care of the backyard before my shower. 6:30 a.m. Breakfast. During the summer, Thursdays are Splash Day at daycare, so we dress our daughter in a rash guard and shorts and pack her real clothes. We also cover her in sunscreen. 7:30 a.m. I go to work while my husband takes our daughter to daycare. 5:00 p.m. My husband and I walk out of work together, but I go to bootcamp and he goes to pick up our daughter and make dinner. 7:30 p.m. I take a shower with our daughter, and my husband puts her to bed. I clean up the kitchen and head to bed afterwards. 1:30 a.m. Our daughter wakes me up by appearing at my bedside. I should take her back to her room, but I pull her into bed with me and she and I are both asleep within minutes. 6:00 a.m. My daughter is awake and squirming in between me and my husband. She’s also whispering to herself, but I can only make out a few words. She does this for 45 minutes, and my husband and I just lie in bed enjoying it. We finally get out of bed, and my daughter and I go out to water the garden while my husband makes blueberry pancakes. 8:30 a.m. My husband and I get every other Friday off, so we’re in no rush today. We usually still take our daughter to daycare on off-Fridays so we can run errands and complete projects (or nap!). I take our daughter to daycare while my husband cleans up the kitchen. When I return, we both clean the house a little. 10:00 a.m. My husband’s allergies are bothering him, so he takes some medicine and lies down for a nap. I work on my latest craft project — a picnic quilt. 12:00 p.m. My husband wakes up and we go out for lunch. We drop off one of our two cars to get a state inspection. We think about going to the movies this afternoon but decide to go home and watch a movie together in bed. 4:00 p.m. The movie is over, and I realize I forgot to go work out today. We go pick up our daughter from daycare and go out for dinner. 6:00 p.m. My husband and daughter head home, and I go to an Indivisible meeting. We’re both members, but I typically go to the meetings and activities, while he watches our daughter. The meetings are held in the furniture shop that one of our members owns (comfy seating! ), and I buy a clock that I’ve had my eye on for a while. 8:30 p.m. I head home. My husband has fallen asleep on the couch. I wake him up, and he does his workout while I go to bed. 5:30 a.m. My husband slips out of bed. There is an archaeological site nearby, and we volunteer with the paleontologists from the museum to help dig at it. My husband and I take turns a couple of Saturdays a month digging. He leaves at 6:00, and I stay snuggled in bed. 7:00 a.m. My daughter comes wandering into my room. I’ve been awake and enjoying just lying in bed. Despite the fact that my husband makes all of our meals, I’m actually a really good cook as well, but I take the easy way out and we have cereal for breakfast. 8:30 a.m. My daughter and I head to the playground. There are only a few other kids there this early. She loves to run around with other kids, though. 9:30 a.m. We go to Costco. 10:30 a.m. I give my daughter a quick snack. She won’t tell me when she’s hungry; she’ll just start fussing and melting down. I usually feed her when I notice an uptick in whining. 11:00 a.m. We go to swimming lessons. My daughter has been taking lessons at a regional chain since she was four months old. She loves it, and always cheers when we pull into the parking lot. 12:00 p.m. My daughter and I head to our favorite burrito place for lunch. We go here every week after swimming, and the staff already knows our order. I get a burrito to-go for my husband. 1:30 p.m. My daughter will sometimes nap at daycare, but she quit napping at home a few weeks ago. I try to read her stories to get her to relax and fall asleep, but she’s wide awake. I give up on the nap and we go play. 2:00 p.m. My husband comes home, sweaty and dirty. He eats his burrito, showers, and takes a short nap. My daughter and I water the garden and the fruit trees in the backyard, and she runs through the hose a few times. 3:30 p.m. We go to a local nursery to look for some more plants for our front yard. The front is total shade, thanks to a lovely live oak tree, but it limits our planting options. The nursery has a playground, so my husband and daughter play while I pick out some hostas. 4:30 p.m. We plant our new hostas under the tree. We’re all tired and dirty again, so we order a pizza for dinner. 6:30 p.m. Since she skipped the nap, I try to put our daughter to bed early. It takes twice as many stories as usual, but she does fall asleep. 7:30 p.m. My husband and I watch TV/surf the Internet for a couple of hours before falling asleep. We actually saw an advertisement for volunteers in the burrito shop we go to after swim lessons. Paleontology was my husband’s second choice after engineering, so I was excited for him to get this chance to experience it. We applied through the museum. We found some fossilized turtle shells, trees, fish bones, a rib to something as yet unidentified, and a lot of fossilized poop. 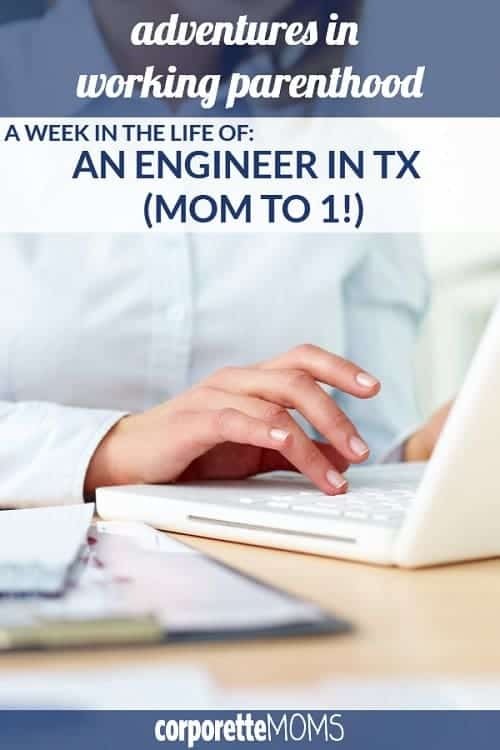 Thanks so much to Jeffiner for sharing a bit of her life as a working mom! 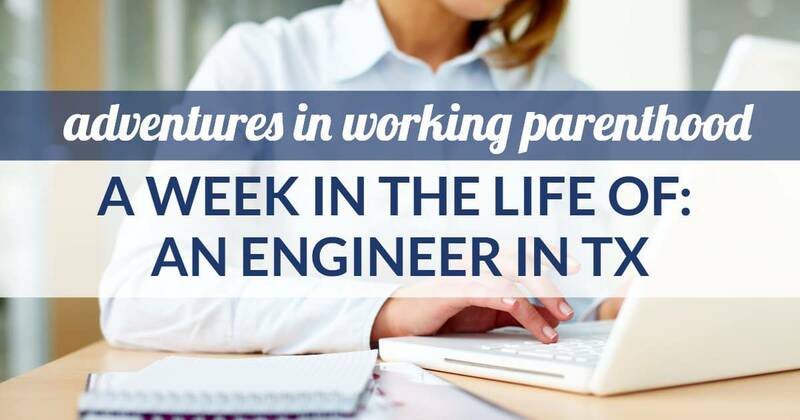 Readers, what’s your biggest takeaway from her week of work as an engineer as well as her general work/life balance? Stock photo via Deposit Photos / pressmaster. First off, I’m sorry to hear about your miscarriage – I hope that things work out for you both in the future. It’s great that you can work together (in the same room!) and not have it be an issue. My husband and I are in different fields so we wouldn’t work directly together even if we worked for the same company, but I think I would go a little crazy seeing him all the time and not having a place of my own – maybe I just like keeping my own set of crazy coworkers to myself! Do you ever experience jealousy of each other’s careers (i.e. promotions, better projects, etc.)? On the note about being a female engineer, I’ve actually seen engineering as a pretty progressive field overall, for both men and women. Much more than my own field (law). 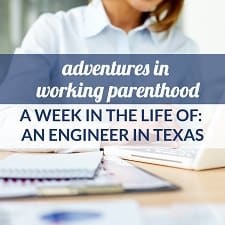 My husband is an engineer and, maybe he’s just been lucky, but he’s always had jobs with normal hours and lots of general flexibility about WFH or taking care of family stuff. The pay is generally good too. Hopefully all the STEM for girls initiatives leads to more women working in engineering in the future. There’s a lot more to it than just STEM initiatives for girls. There are actually significantly fewer women in computer science today than in the 1980s. Not all fields are as bad as CS but engineering has its issues just like law. Thanks. I’ve actually been promoted and gotten better projects than my husband in the past year, and he has admitted that he’s been a little jealous. But he’s still happy for me and it hasn’t affected our relationship. He actually got promoted last week. I think engineering is pretty progressive overall, too. I know some of my female friends have had some challenges, and I always feel like a bad feminist when I admit I haven’t. Maybe this means the world is starting to improve in some areas? I certainly don’t think we’re all the way there yet. And yes, we do have flexible hours and good pay. A sad retort to progressiveness in engineering: it depends on the sector. I’m an engineer working in the oilfield (non-oil degree, though) and it seems like our culture is not changing swiftly or easily. Joining Indivisible today. Thanks for that heads up!! Likely more important for your commitment in TX than mine in MA, but nonetheless, excited to be a part of it (& thanks for doing your part there!!). It sounds like you guys have an amazing, balanced life. Hope to get there one day! All the best on #2. It seems like you and your husband have a great division of labor and do a pretty equal job of balancing cooking/childcare/household responsibilities. How did you get to this point? Was it something you naturally fell into (it probably helps that you work in similar roles at the same place, so you have a really great understanding of the other person’s work commitments and demands), or was it something you explicitly talked about and developed over time? Originally I did the weekly menu and grocery shopping myself, and I hated it. I wanted to do one of those meal delivery services instead. My husband thought I liked making the menu, so instead of the meal service he offered to do the task with me. I used to to bedtime every night too, and asked him to trade off to get a break. That may have backfired on him since now she’s all “I want Daddy!” every night. I do put her to bed a few nights a week, because I know how hard it is to do all the time. Sorry to hear about your miscarriage. Thanks for letting Kat post your story, even though it must be rough to think back on this week and your pregnancy. I also had a miscarriage after my first (who was also 2.5 at the time). Best of luck to you and your husband as you TTC again. You and your husband sound SO cool – paleontology, volunteer work, backyard garden. It appears that you have a good amount of activities in the week; they don’t appear to overwhelm you. I really enjoyed reading about your week, thank you! Echoing everyone else that I am very sorry to hear about your miscarriage, and wish you the best with TTC. You and your husband seem to be so in synch with job, hobbies, etc. was that what brought you together or did you learn to enjoy each other’s passions? Thanks! I think it was our shared interests that brought us together. We met at work when I was transferred to his team. We both owned fixer-upper houses that we were DIY-ing, so we did a lot of that together before marriage and children. We both love to travel. Of course we have separate hobbies, but we do share a lot of common interests. Thank you for sharing! I echo those above that I am sorry to hear about your miscarriage. I really appreciate these windows into other people’s lives and it sounds like you guys do a lot of fun things! I feel so much comrodery with you! I’m an engr, married to an engr. He was actually in the Army when we met, but everyone assumed we met in college. I had a fantastic college experience, similar to what you said. Great group of friends, of which I was thr only woman and it didnt matter whatsoever. Industry has not been as kind, but overall I am thankful for my career. The older generation (that was going to engr school in the 70s and early 80s) and some operators in manufacturing gave me a really hard time when I was younger. It took a bit to get my feet under me to stand my ground. But once I did its been a non issue. I’m so sorry to hear of your loss. I lost my first pregnancy earlier this year. It was crushing, devastating. A few months later I was pregnant again and I’m 18 weeks along now. Stories of hope kept me going, so I hope hearing mine is a source of comfort. Thanks for sharing your story. It was heartwarming to hear another couple so similar to us enjoying their first born and keeping up with passions and career. I really enjoyed this post. Other than working together and being an engineer (although my husband is), this seems fairly similar to our routines and lifestyle. Especially how you’ve maintained your fitness and when you schedule it. Hubby enjoys working out in the evening. I am also a morning person, but I generally get up early, work a few hours, run after hubby and kiddo leave for work/daycare, and then get ready for work. That seems easier for me and in the end gets me the same amount of work done by the same end time. As a Houston native, I love when Houstonians are profiled! I also appreciate anything that calls out the fact that Houston (and TX generally) isn’t just a bunch of old school conservatives. There is so much happening with the November elections in Houston and TX — awesome for y’all to be part of it. I feel like everyone I know in my age group back home is involved; I hope this means change is coming. Htown Represent!